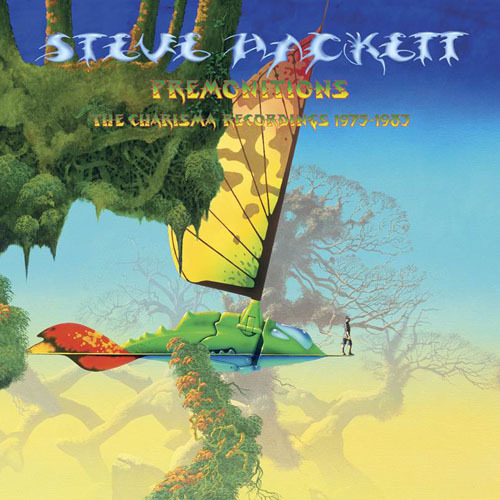 A few weeks ago, Steve Hackett released 'Premonitions - The Charisma Recordings 1975-1983', a comprehensive reissue project that includes his first 6 albums on the Charisma label, together with a wealth of previously unavailable recordings as well as remixes by Steven Wilson. 'Premonitions' is released on 23rd October by Universal Music Catalogue/Virgin. 'Premonitions' comes in a Super Deluxe box set featuring a total of 135 songs on 10 CDs and 4 DVDs (5.1 mixes), plus an extensive booklet; included in this version are 67 previously unreleased recordings between old and new tracks, live and remixes. "I'm pleased that Steven Wilson has done several new mixes in both surround and stereo" - Hackett has declared - "The box set will also contain a number of live shows from the era. I've enjoyed being involved with this comprehensive trip down memory lane. There's also a substantial booklet containing a lot of background info along with many wonderful Armando Gallo shots, and Roger Dean has painted a beautiful picture for the cover. For me it's a proud souvenir that highlights those years. I'll play plenty of this early work at shows in the autumn which will include some numbers not played live for many moons, like 'Icarus Ascending' and 'Star of Sirius' plus all time faves such as 'Every Day' and 'Spectral Mornings'." Hackett's two most successful albums from the Charisma era, Please Don't Touch and Spectral Mornings, will also be re-released separately in a deluxe expanded version with 5.1 mixes by Steven Wilson in 2016. Both records were previously reissued in 2005 as expanded single disc sets. 2015 marks 40 years from the release of Steve Hackett's first solo record Voyage of the Acolyte; He was the first member of Genesis to release a solo album, before leaving the band in 1977. Hackett's musical career has been blooming over the past four decades, establishing him as a loved icon and pioneer of the genre. His current studio album Wolflight was released in March to critical acclaim, charting at 31; it's the first studio album of new material since Beyond the Shrouded Horizon in 2011 and explores past and contemporary cultures in a revolutionary journey. The 40th anniversary celebrations continue with 19 UK shows on the 'Acolyte to Wolflight with Genesis Revisited Tour', where fans will have the opportunity to relive the Charisma years while discovering the guitarist's more recent work, together with a selection of Genesis tracks previously unheard live.